The advent of helical and now multichannel CT has allowed CT to become a powerful tool for imaging the vascular system. The technique involves a thinly collimated helical scan through the renal vascular pedicle during a venous injection of iodinated contrast media. With each scanner generation, resolution has improved. Now we can image isotropically and reformat in any plane while maintaining image quality. Improved speeds now allow scanning of the aorta from diaphragm to iliac bifurcation within a single breath-hold. However, the imaging of renal arteries sets a difficult challenge for CT, because they run parallel or slightly oblique to the scanning plane and accessory vessels can have submillimeter dimensions. It has several advantages over conventional angiography. It is relatively noninvasive in that it does not require an arterial injection and so has consequent decreases in physician time, cost, in-patient hospital stay, patient discomfort, and complications. 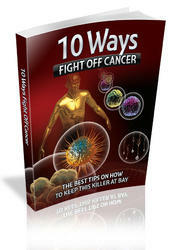 With improved technique it may also allow for a lower patient dose (67). CT angiography (CTA) may be used to plan the optimum projection for subsequent angiography and/or intervention (64). Figure 7 (Figure on facing page) (A) LAO 20 view from the flush aortogram of a hypertensive patient. There are one right and two left renal arteries. A significant nonostial stenosis was present in the lower pole, accessory left renal artery (arrow). (B) This was resistant to conventional angioplasty but responded well to treatment with a 4 mm cutting balloon, followed by repeat dilatation with a 5 mm conventional balloon. The posttreatment appearance is shown with the guidewire still in the lower pole artery. (C) Pretreatment carbon dioxide angiogram in the same patient. 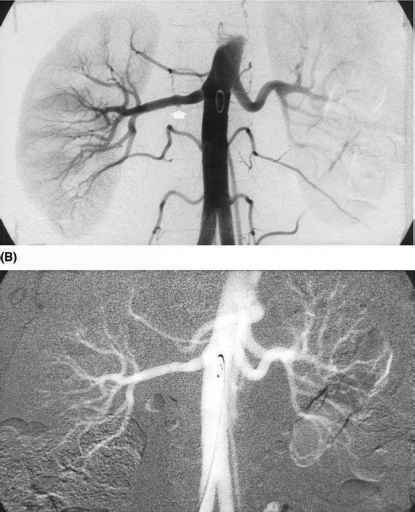 Note that although the main renal arteries and large accessory artery are reasonably well opacified, the intrarenal vessels are not seen as a result of bolus fragmentation. Abbreviation: LAO, left anterior oblique. Figure 8 (A) Flush aortogram in a young hypertensive patient demonstrating minor aneurysmal beading (arrow) of the right main renal artery but no definite stenosis. The left renal artery was normal. (B) Carbon dioxide angiogram in the same patient. The aneurysmal segments are visible but less obvious. On selective catheterization and pressure measurement, there was a 30 mmHg gradient in the main artery. This was abolished following angioplasty. The appearances are consistent with FMD. 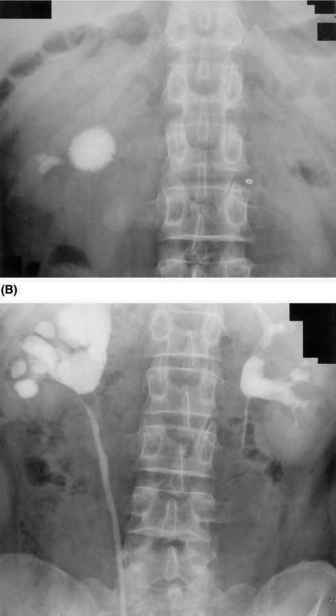 Abbreviation: FMD, fibromuscular dysplasia. axial slices by means of a linear interpolation algorithm. Currently, 180° interpolation is used because it decreases z-axis blur (62), allowing lower effective slice thickness. Contrast administration should maintain an enhancement plateau throughout the entire scanning period. This is best achieved by using bolus-triggering software. A region of interest is set in the aorta and sequential scans are performed at this level. When enhancement in the region reaches a predetermined threshold (usually 50-100 Hounsfield units), the scan is automatically triggered. With single slice scanners, 120 to 150 mL of contrast injected at 3 to 5mL/sec is sufficient (68). As multichannel scanning is faster, the plateau phase can be shorter, and so less contrast is required. In addition, if the contrast bolus is chased with a 40 mL flush of saline, the plateau can be prolonged by up to eight seconds (68). Table 7 outlines an example of a scanning protocol for a 16-channel multislice CT.